London Restaurant Festival is pretty much my favourite time of the year as its when lots of fantastic restaurants offer special menus for great deals. I've had some really great menus at places that I already loved as well as discovered some new restaurants through this in the past, and this year my first stop was 5th View Bar & Food - located at the top of Waterstones Piccadilly, Europe's biggest book shop. I made a bit of a mistake when I first got there and decided I didn't want to queue for the lift. I quickly discovered that the stairs went on for a lot longer than I thought they would (and that my friends were not very happy with my decision either) and that there were apparently a lot more books I wanted that I hadn't even known about as well. 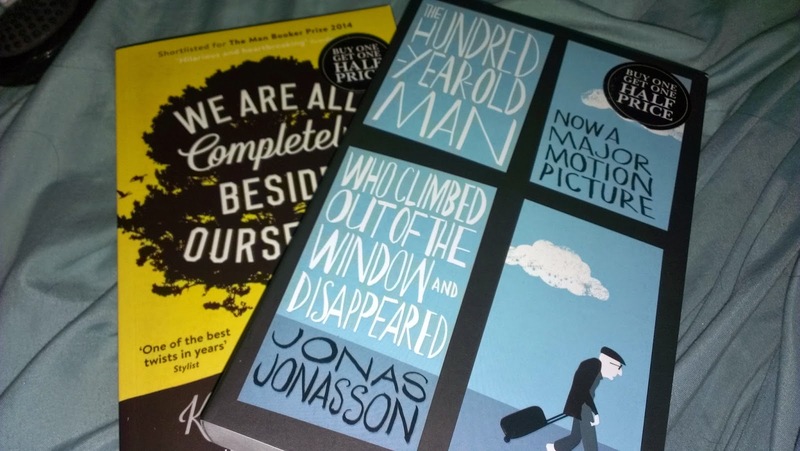 So before I'd even made it to the restaurant I'd ended up buying We Are All Completely Beside Ourselves by Karen Joy Fowler, and The 100 Year Old Man Who Climbed Out of the Window and Disappeared by Jonas Jonasson. I have a bit of a book backlog at the moment (I'm on And The Mountains Echoed at the moment, and there's two more books behind that but to be honest I've been putting those off for a while so there's a good chance they might be skipped...) so don't expect a review of these too soon, but, well, I do have an awful lot of free time coming up so who knows? While there I also placed an order for Sapiens: A Brief History of Humankind. I've been eyeing this book up on Amazon for a while now and when I saw it in Waterstones I had to have a quick look through as though I knew I'd find the topic interesting I just wasn't sure if it was a book I'd be able to actually get through. Luckily it is, so that should hopefully be arriving any day now! 5th View has quite a disappointing view actually, but is a nice little restaurant. It's not very book shoppy up there which surprised me - I thought they could make a bit more out of it but no, it's more its own little thing up there. 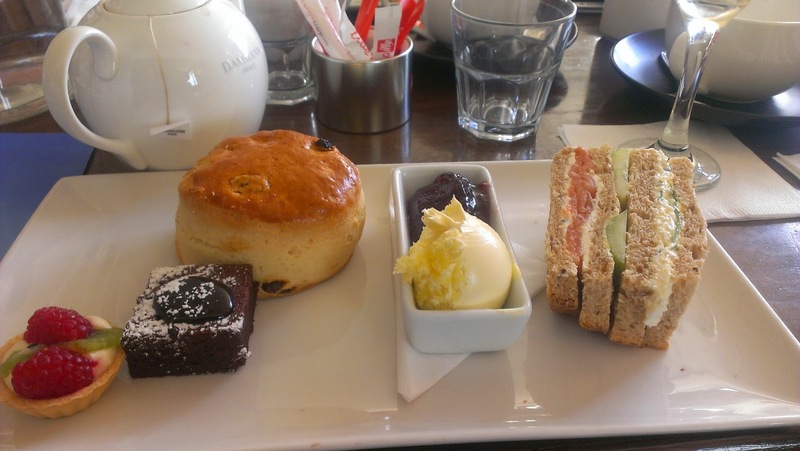 The afternoon tea was a special menu and cost £9.95 and included a glass of fizz - I thought it was great value! It's not your normal endless quantities of food that you'd get in an afternoon tea but it was exactly enough to leave me feeling completely satisfied and not really wanting anymore - you get one giant but tasty scone, two sandwiches, a brownie and a little fruit tart which doesn't sound like much when I write it out but was really very filling and delicious and I thought was good value, especially with the fizz. It does of course also come with tea, but I don't actually like tea so I can't really give you any good feedback on that. 5th View is located on the top of Waterstones Piccadilly and is open for both lunch and dinner. If you'd like to have the menu I've mentioned above then you have a little bit of time left as the restaurant festival ends on the 27th of this month! Nice review! I've never gone for afternoon tea before!